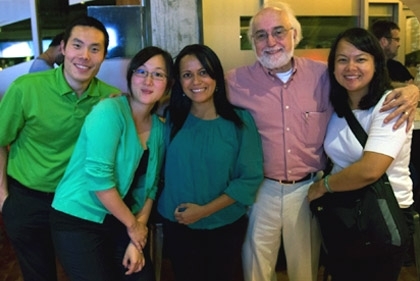 Jon Keng, Mercyanne Andes, Millali Marcano, and Sunyoung Bang are students in the Tufts Gordon Institute Masters in Engineering Management program (shown here with Professor Sam Liggero). As a part of the program, students are engaged in short-term consulting projects to allow them to experience real-world challenges. With experience in technical companies such as Momenta, General Electric, and BD Biosciences, they chose Sustainable Minds as their sponsor company for their summer practicum project. After finishing our first year in the Masters in Engineering Management program at Tufts Gordon Institute, we’d learned that design for the environment has become a key part of many companies’ business strategy. As professionals in the fields of Research and Development and Manufacturing, we can now visualize starting new product development or redesign projects using the full capabilities of Sustainable Minds. Sustainable Minds’ powerful software can be used to evaluate the environmental impacts in any stage of a product’s life cycle, and when applied to all can have tremendous impact. The goal of this Tufts Practicum project was to work with Vers and Sustainable Minds to evaluate the environmental performance of a new product in development, benchmark it against a leading competitor, and inform the development process by identifying ‘greener’ options. We used Sustainable Minds software to compare the Vers Q (a compact, mobile, wireless speaker system) with a current market leader of a similar feature set and price point. To learn more about Vers and it’s commitment to chic and ecodesign, read Part 2: Chieco (Chic + Eco) = A design philosophy that makes products sell like crazy! We received the competitive product in its original packaging, unopened, and proceeded to disassemble it into separate components down to the smallest possible pieces without the use of any special tools. We then weighed each component and estimated its material composition. Once we created the bill of materials (BOM) for the competitor, we received the necessary comparative information for the Vers Q to conduct the comparison in Sustainable Minds. The comparison of the two products showed that the Vers Q had created approximately 46% less overall environmental impact than its competitor. Our analysis identified Vers’ greatest impact areas, which were not obvious and contributed to key learnings of the project. Through the design of Vers Q, the greatest impact was assumed to be the casing and packaging. Our analysis revealed that the electronics and PCBs, when compared to all of the parts of the Vers Q, represented the greatest. Wow! This was ‘eureka’ for the team. With all of Vers’ extensive effort and attention to the phases of the product’s life cycle, Sustainable Minds was still able to identify further improvements to an already ‘greener’ product. It was amazing to discover the information that could be derived from the software and how powerful it is. Sustainable Minds doesn’t just indicate impacts at end of life but in each of the life cycle phases of the product – from manufacturing, packaging, delivery, use, to end of life. The level of detail of information for each material is amazing. The software offers multiple visual graphical results that are comprehensive and also help to determine levels of impacts like eco damage, health damage, and resource depletion. It was revealing to discover the many ways one can implement sustainability. Before this project, our mutual understanding of sustainability was to recycle, reduce waste, and substitute materials that have less environmental impact. When selecting companies for our summer practicum project, we individually took great care in choosing one that was aligned with our interests. Sustainability, in our current professional roles, products we purchase, and products we actively develop in our current jobs was of common interest for all of us. We were all hoping for an approach to sustainability other than the typical “let’s look for recyclable material.” We wanted to expand our general knowledge of reducing impact to the environment beyond ‘reduce, reuse and recycle’. We couldn’t have hoped for a better fit being able to work with both Sustainable Minds and Vers. The most significant learning on this project was that it's important to try to reduce impact on the environment and do so in a way that makes business sense. It was a pleasure to work with such inspirational leaders like Terry and David, paving the way for sustainability by providing tools and setting examples for what is possible. The software is a tool, essentially an information database to help people find ways to design their product for improved sustainability. However, the software does not give you the answers; it does not make choices for you. The user needs to identify the problem and know what they want to achieve. This requires the right knowledge, skills and commitment. There are always ways to be greener. Terry Swack, CEO, for giving the team the opportunity to work with the company. We have certainly learned a lot about the company and have been inspired by her passion, drive and strategies to innovate through environmental performance. Joep Meijer, LCA Technical Expert, for his experience and knowledge. The level of detail that he identified with any given item was just fascinating. He really showed us what it means to examine something on many different levels. Cindy Bayley, Project Coordinator, helped to facilitate the project and to provide a great deal of insightful suggestions, feedback and resources. Vers founder, David Laituri for allowing us to work with his product, he showed us the power of storytelling, and that green and can make a lot of business sense. Tufts Gordon Institute advisor, Professor Sam Liggero, was with the team throughout the project giving us encouragement and positive feedback.